Makes an excellent transport load. Lowered for travelling on site. 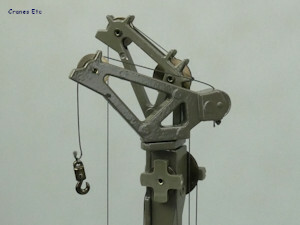 Metal pulleys on the leader head. 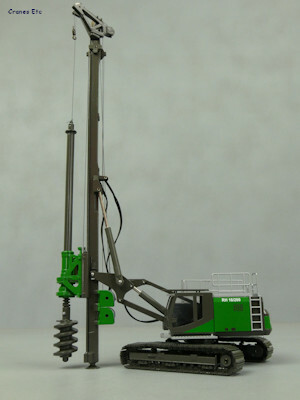 The Delmag RH 18/200 Piling Rig modelled here is fitted with a BT 200 rotary head. Delmag is part of the ABI Group. 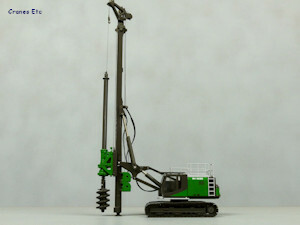 The real machine is used for a variety of foundation tasks including small diameter piles. 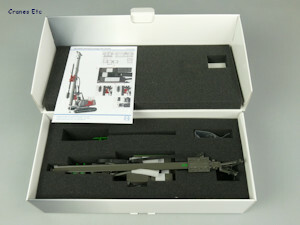 The model comes in a good quality Delmag-branded box with the model packed within black foam rubber. There is no information about the real machine. A simple instruction sheet describes the assembly. 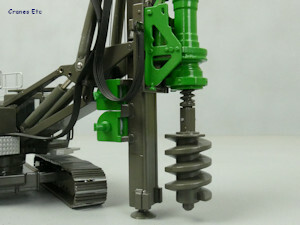 The undercarriage has metal tracks mounted on frames which have no working rollers. The drive sprockets and idlers are plastic with a good colour match. The metal tracks are robust. The cab has good metal grab rails and a roof protection screen, but there are no mirrors or wipers detailed. 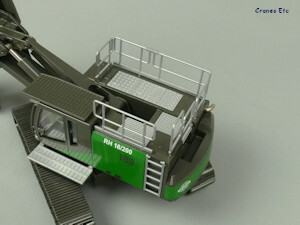 The walkway outside the cab is fixed and it would have been better if it was removable or foldable for transport. A metal ladder climbs the side of the body. 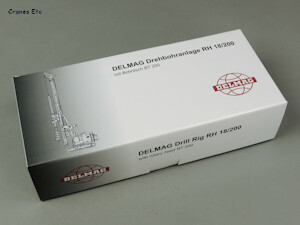 At the rear the counterweight is modelled well and there is a very nice Delmag logo. The exhaust pipe is metal. The upper surfaces have a variety of different textures, and the handrails are robust metal. Soft hydraulic hoses run to the front. 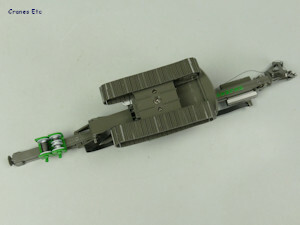 The leader and components are almost all metal and are well detailed. 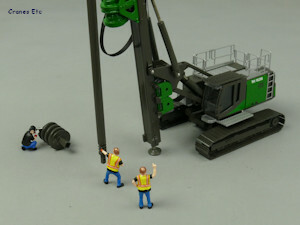 The soft hydraulic lines run to the tool sledge and they hang realistically. Hydraulic ram jackets are plastic with a very good colour match. A very nice detail is the reeved rope lines for controlling the sledge. At the top of the leader is an auxiliary rope and hook but this is non-operating. The rotary head is a heavy metal part and it has some nice fine detailing. The kelly bar is also metal, as is the auger. The blade of the auger is a little thick for the scale. The tracks are stiff but roll well enough on a rough surface and are tensioned by springs in the idlers. The body rotates smoothly and without any rocking. 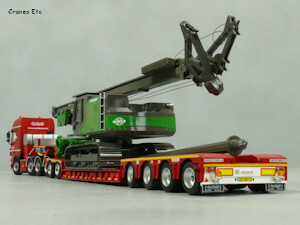 The leader mast is movable and can be posed in transport mode or erected. Two winches can be operated using supplied keys. One controls the movement of the sledge up and down the leader, and the model is supplied reeved. The second winch controls the raising and lowering of the kelly bar. 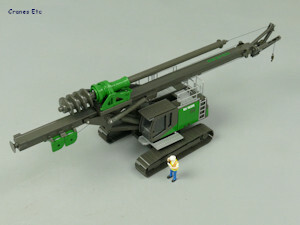 The auger can be rotated. The auger can be detached from the kelly bar by removing a pin, and the kelly can be withdrawn from the rotary head meaning realistic transport loads are possible. 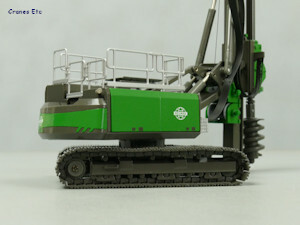 The model can be displayed in transport mode with the handrails removed. 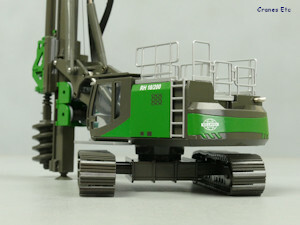 This is solid and heavy model with a high metal content. 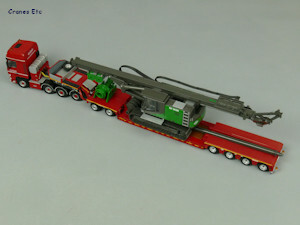 This is a very nice model of a Delmag drilling rig. It is a good looking and functional model, with the typical robust and heavy feel of a Conrad model. The model first appeared in late 2017 in Delmag red as model #2515. 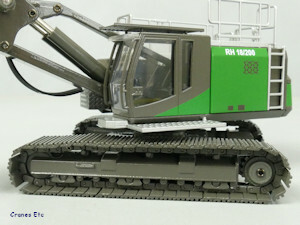 This green version appeared in July 2018. Auger blade is a bit thick.